If chartreuse gets the distinction of “the new neutral,” then dare we describe purple foliage as the horticultural equivalent of the little black dress? Well, in my reality, work boots and a boonie hat are the perfect accessories for any outfit, so I’m on thin ice making fashion-related analogies. But I think I have a grasp of the theoretical concept of the LBD, as being perfect for almost any occasion because you can dress it up for drama or leave it unadorned for an effect of understated elegance. And if that’s right, then I’d say that those qualities definitely apply to purple foliage (like that of Pseuderanthemum atropurpureum ‘Rubrum’, above) as well. Dark foliage is a natural addition to combinations featuring bright colors, adding a touch of moodiness that keeps the effect from getting too gaudy. 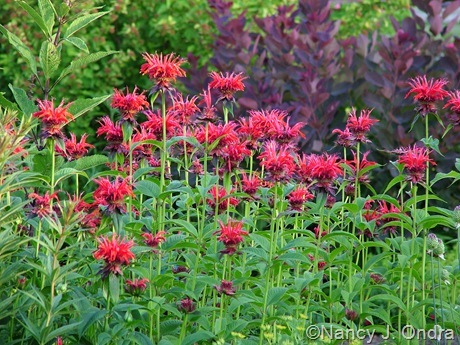 Brilliant ‘Jacob Cline’ bee balm (Monarda) is one of my favorite reds, but even I’ll admit that it can be overwhelming in large amounts. Green companions don’t help, because they just make the red that much more intense; the same goes for silver or chartreuse, to my eye. So most of the time, I pair ol’ Jake with purple-leaved partners, such as the lacy leaves of this seed-grown dahlia from the Bishop’s Children strain (above), or I give him a dark backdrop, such as ‘Velvet Cloak’ smokebush (Cotinus coggygria) below. Now, I realize that some of you would disagree that orange looks good with anything. But I tend to think that it pairs with purple as well as red does. Below is ‘Sedona’ coleus (Solenostemon scutellarioides), which can appear rosy red, brick red, or peachy orange (or all three), depending on the weather, the age of the leaves, and the amount of sun it gets. I love it, but its variety of colors makes choosing good companions a challenge. Green and chartreuse foliage work well here, but purple is even better. The partner shown in this photo is a terrific little tender perennial sold simply as Euphorbia ‘Flameleaf’. I haven’t found it locally for the last few years, but it looks like Glasshouse Works is still selling it. If any of you know it by another name, I’d be grateful for the info. Purple fountain grass (usually sold as Pennisetum setaceum ‘Rubrum’) is another one of my favorites for dark leaves, all the more so because there are relatively few other solid purple-reds with grassy foliage. 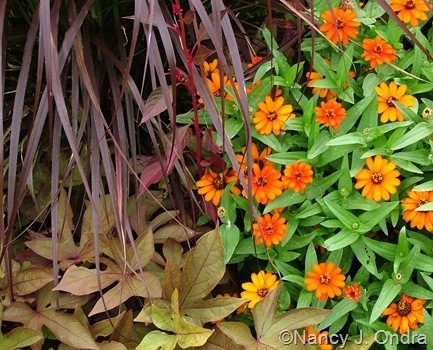 In the August shot above, it’s paired with the rich orange of ‘Profusion Orange’ zinnias, as well as ‘Sweet Caroline Bronze’ sweet potato (Ipomoea batatas). 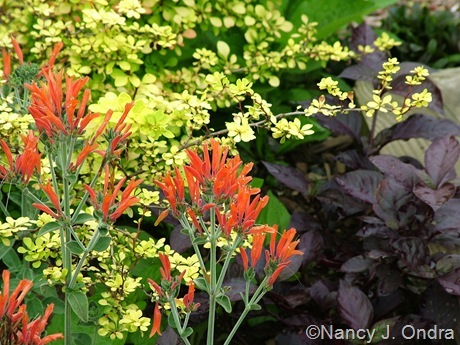 Across the path from that combination is a mid-May pairing (shown below left) of the same ‘Velvet Cloak’ smokebush mentioned earlier, here paired with ‘Fireglow’ spurge (Euphorbia griffithii). 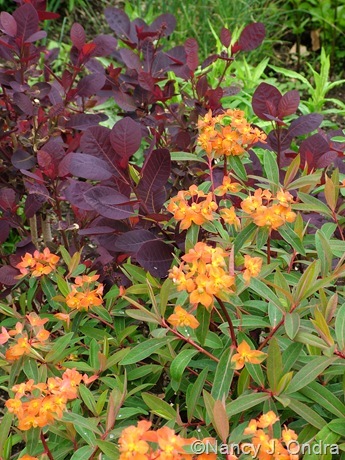 And below is a July combo of rich orange Dicliptera suberecta, yellow-leaved barberry (Berberis thunbergii ‘Aurea’), and near-black Alternanthera dentata ‘Purple Knight’. 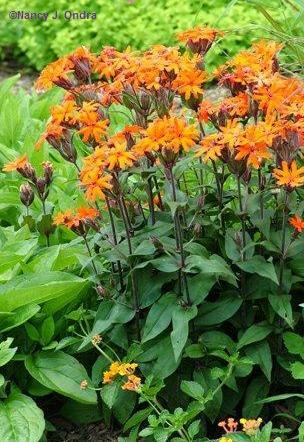 ‘Vesuvius’ Arkwright’s campion (Lychnis x arkwrightii) includes both purple and orange on the same plant. The new growth is solid purple, but by bloom time, it’s mostly only on the stems. 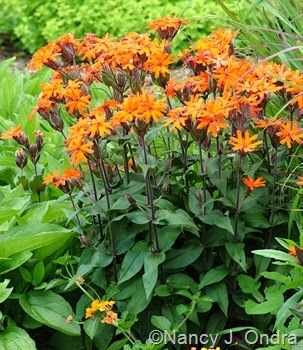 This hardy perennial is showy surrounded by bright greens, as in the photo above, but I think it would have been even more dramatic with deep-purple partners to echo the stems. I’ll have to try that this year, perhaps with ‘Sweet Caroline Purple’ sweet potato along the edge of the border. 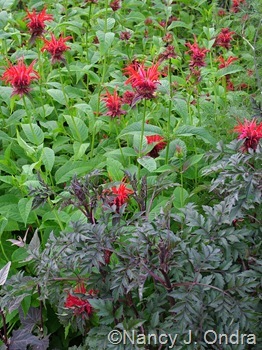 And behind it, maybe I’ll try red orach (Atriplex hortensis ‘Rubra’), as shown in the combinations below. 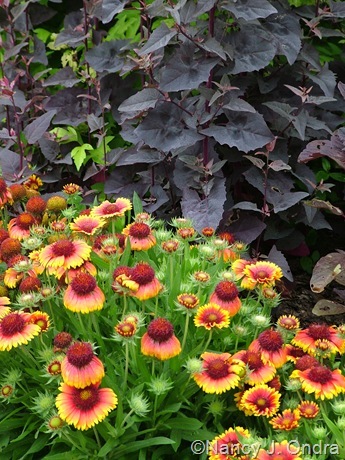 This upright foliage annual looks good with the orange-and-red of ‘Arizona Sun’ blanket flower (Gaillardia x grandiflora), shown above. 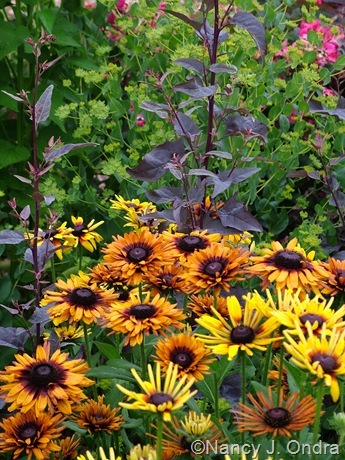 I also like the grouping below, with the contrasting rich petals and echoing deep purple centers of ‘Chim Chiminee’ coneflowers (Rudbeckia hirta). Part 2 will show some other high-contrast options for purple pairings, but no more orange: I promise. Wonderful photos of beautiful plants. Love that vesuvius, the name and the plant, must look for that one. Ah, oops! I’d meant for this to go up on Tuesday, rather than today, so Steve’s post at Gardening Gone Wild would be up first. Darn this technology anyway. Oh, well. Thanks for the comment anyway, Frances! Giggle. I love orange–and with purple, too–and I never would have thought of tempering Jacob Kline with something with deep coloured foliage. Love it! As always, a delicious post, Nan. Um, thanks, Jodi. Be sure to check GGW tomorrow for Steve’s take. And yeah, as if we needed one more reason not to like deer. Apparently slugs are the intermediate host for the parasite, so I have double reason to dislike them too! I love these color combinations! You do a marvelous job with the placement of your plants, Nan. I’m so very impressed with your talent. I know I’ll be coming back here often and checking these post again come spring when I’m looking for ideas. Thanks, Robin. I’ve created many spectacularly bad combinations, too; I just haven’t subjected you to them. But if you find some inspiration in what I think are the better ones, then I’m thrilled. Hi Shirl! Yes, I think orange has a way of sneaking up on you, if you’re not careful. I had a settled dislike of orange even before I decided I didn’t like white, and you see what happened! Nan–We share a lot of the same favorites. I’ve got “Jake” lounging in front of purple smokebush too. But my ‘Fireglow’ is floppy, don’t know if it’s not enough sun (2-3 hours of direct sun a day)or the soil is too rich. And BTW, I love orange, and plan to show you all about it (Don’t tell MMD!). Hey, Steve! Yep, I’ve noticed that we have very similar taste in plants. ‘Fireglow’ has done way better for me than I expected; it does get sun from dawn to dusk, though. I tried to keep the ‘Flameleaf’ euphorbia over the winter, but it didn’t last long (I’m fatal to most plants once they come inside), and it didn’t self-sow for me, either. I wonder why it’s nearly dropped out of the trade; it seemed to be everywhere around here a few years ago. Wow Nan! 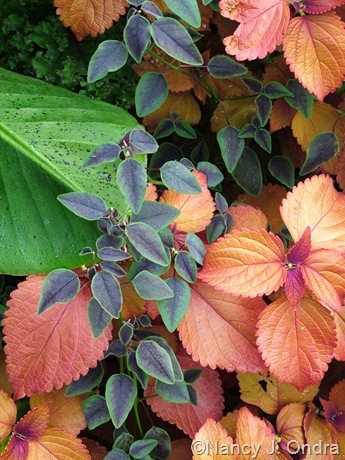 Some of these combinations are simply stunning–I especially love the two with the coleus, the one with ‘Velvet Cloak’ and ‘Fireglow’, and the yellow-leaved barberry, Dicliptera, and Alternanthera ‘Purple Knight’. Just fabulous! I, too, came to love orange (after hating it forever) once I began to put together fabric swatches for quilt blocks. It quickly became obvious how wonderful orange could be with so many colors, and as a color bridge, and from there it was just a micro-hop to the garden. That was a painful lesson, but it taught me two things: first, to never discount any color–there will be a good use for it somewhere, sometime–and second, that the colors we dislike tend to be the ones that don’t look good on us! I’ve tried to separate my fashion favorites from my garden, with some success, though you might say it’s backfiring as well–I now have several orange tops! Ooh, I can definitely see how putting fabrics together for quilts could give you lots of great ideas for combinations to try in the garden. I’m not sure about the connection between the colors we like in the garden and the colors we wear. I mean, I’ll wear any color as long as its dark blue, green, brown, or black. And *maybe* burgundy, if I haven’t done laundry in a while and run out of my usual wardrobe. I absolutely love chartreuse plants in the garden. 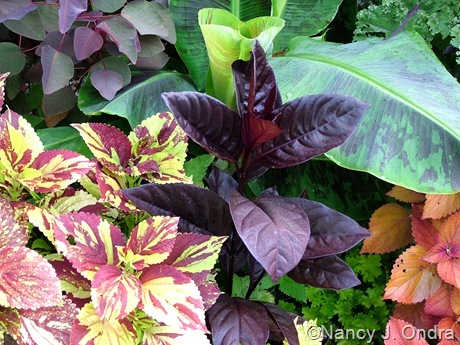 It seems as though every color goes with it, and your purple plant just jumps out at you. Great color combination! Welcome, Susan! If you feel the need for even more our of favorite color, check out Jodi at Bloomingwriter’s posts Acid-Green, Chartreuse, or Gold? and Chartreuse 2 – The New Neutral?. Enjoy! I get our beautiful book Foliage today. Very much to read and alot of insperations. So many plants that we just must have. Can I make a contribation on my blog for our book? Hi Ken! I’m so happy that you like the book. I’m amazed you were able to acquire a copy! Certainly, if you wish to mention it on your blog, of course you may. I hope you’ll continue to feel that it was worth your effort to get it. I missed this Part 1 because I was in Florida. See what happens when you’re not home to defend yourself? True enough that you didn’t say it doesn’t look good with dark purple.